New data from VDOT show the move to tolling and expanded HOV hours on Interstate 66 inside the Beltway has boosted speeds in the morning, but it has had little impact on travel times during the heart of the afternoon rush hour. WASHINGTON — The move to tolling and expanded HOV hours on Interstate 66 inside the Beltway has boosted speeds during the morning rush hour, but it has had little impact on travel times during the heart of the afternoon. Extended hours for HOV rules implemented alongside the tolls have driven some faster trips on the edges of the old afternoon rush hour period, new Virginia Department of Transportation data show. On I-66 between Rosslyn and the Capital Beltway, the average travel time westbound between 4:15 p.m. and 6:30 p.m. was essentially unchanged in February 2018 compared with February 2017. Travel times did improve between 3 p.m. and 4:15 p.m. and between 6:30 p.m. and 7 p.m. The old HOV hours were 4 p.m. to 6:30 p.m. westbound and 6:30 a.m. to 9 a.m. eastbound. In the morning rush, the expanded hours and tolling rules have generally sped up trips when considering the entire new four-hour HOV or toll period. Trip times improved up to five minutes between about 5:45 a.m. and 7 a.m. in February 2018 compared with February 2017, with less significant improvements — a minute or two — between 7:30 a.m. and 8:45 a.m.
Toward the end of the morning rush hour, though, eastbound travel times were actually a few minutes slower this February between about 8:45 and 9:15 a.m., as drivers appeared to react differently without the rules of the road changing at 9 a.m.
A VDOT performance report highlights the average speeds and travel times during the entire new four-hour restricted periods each way, which have improved overall in both the morning and the afternoon largely due to the inclusion of the extended rush-hour periods. On parallel routes included in the report, VDOT found only modest traffic changes in February. Average speeds on U.S. 50 were slightly slower in the morning and afternoon, with faster speeds eastbound after 8:45 a.m. and westbound between 3 p.m. and 4:15 p.m.
On Route 7 and U.S. 29, average speeds increased slightly over the four-hour rush periods, with the most consistent time savings coming in the morning rush. The George Washington Parkway has slowed down slightly in the morning, but saw significantly faster speeds in the afternoon. In the morning, a southbound trip was relatively unchanged, with the exception of a slightly faster trip this February between 7 a.m. and 7:30 a.m. and a slower trip after 9 a.m. Trips are now faster during the entire four-hour period in the afternoon, with the most significant changes between about 4:30 p.m. and 6:30 p.m., when trips averaged up to eight minutes faster this year. Overall, average speeds rose from 30.7 mph to 40.4 mph on the northbound GW Parkway in the afternoon, cutting average travel time by more than four minutes between 3 p.m. and 7 p.m.
Other changes and construction projects besides the I-66 tolls have also had an effect on parts of these other roads over the past year, so not all of the changes can be directly linked to the toll project. For drivers paying the toll with an E-ZPass or through a violation notice, the average price paid in February was $8.71 in the morning toward Rosslyn and $4.51 in the afternoon toward the Beltway, for a total of $13.22 round-trip. “We have been monitoring the tolls, and they’re staying right around $12 or $13, so we’re pleased with the way the project’s going,” Gov. Ralph Northam told WTOP Wednesday. Since tolling began Dec. 4, the average round-trip toll is $12.01. Usage and average toll rates are increasing as drivers get more comfortable with the new rules. The averages paid include trips taken on only a portion of the road, which lowers the average since the tolls are partly based on distance traveled as well as the number of cars on the road at the time. 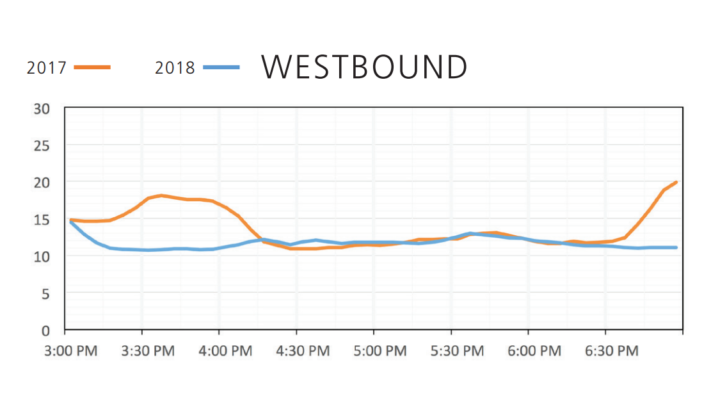 In part due to the congestion-creating eastbound merge with the Dulles Connector Road, tolls eastbound in the morning are significantly higher than the westbound tolls in the afternoon. VDOT is set to widen eastbound I-66 between the Dulles Connector Road and Ballston over the next two years. Only a few drivers — 989, about 0.25 percent of toll payers — paid $40 or more in February for a single trip. About 14,000 drivers used the road each day toward D.C. between 5:30 a.m. and 9:30 a.m. and around 16,600 used the road each day toward the Beltway in the afternoon between 3 p.m. and 7 p.m. in February. That continues an increase since the toll system launched Dec. 4. Around two-thirds of those vehicles are paying a toll, and 44 percent of drivers are paying the variable tolls with an E-ZPass. Twelve percent of vehicles are traveling without an E-ZPass. In most cases, with some exceptions such as motorcycles, traveling without an E-ZPass triggers what can become an expensive violation notice and fines through the mail. The ratio of those riding without an E-ZPass is relatively flat since just after tolls began. Forty-four percent of all drivers are riding free with an E-ZPass Flex switched to HOV mode to indicate they have at least one other person in the car.